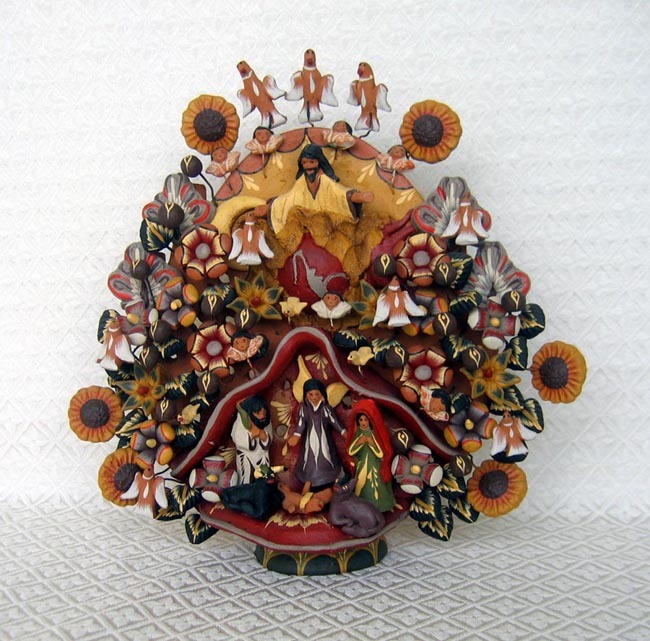 This large Tree of Life Nativity is handmade and hand-painted in Mexico of earthenware pottery to resemble an elaborate tree. The Nativity is also a candle holder with four small cups hidden behind the scene for candles. Wire is used to attach many leaves, flowers, angels, birds, and other fanciful details. This piece features God at the top hovering over a world globe. The country of Mexico is outlined on the globe because this Nativity came from there. The Nativity scene of Mary, Joseph, baby Jesus, angel, and two animals lies below God and the world. The scene measures 11.5 inches tall by 11 inches wide.